Men move filing cabinets into a truck outside Lindsay Park's office. EAST WILLIAMSBURG — The board of one of the city's largest middle-income housing co-ops, Lindsay Park, is being investigated by the Brooklyn District Attorney's office, according to locals and a law enforcement source. Authorities showed up at the more than 2,700-unit complex after 10 a.m. on Thursday, hauling away files and computers from apartments, the chief superintendent's office and the board's office, according to Lindsay Park residents. The action was part of an ongoing investigation against Lindsay Park's board, the law enforcement source said. Carlos Estronza, who used to work as a security guard there and whose fiancee lives in the complex, said he saw at least six badge-wearing officials in the office of Marvin Daniel, Lindsay Park's chief superintendent. The men identified themselves as being there from the District Attorney's office and said they were investigating the board for "mistreated money" and potential corruption, Estronza added. The DA's office did not have further information. 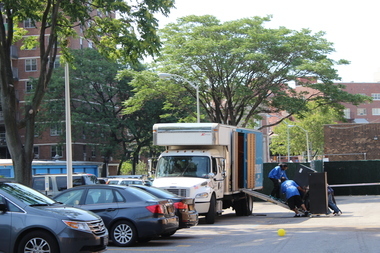 On Friday morning, a moving truck was also hauling away filing cabinets from the housing complex's office at 202 Union Ave.
Cora Austin, the president of Lindsay Park's board, denied that she was being investigated and said she didn't know anything about a probe against the board. "They are all allegations," she said. She also claimed that the co-op's shareholders who have been speaking to press are "disgruntled" and "the most hated people ever" at Lindsay Park, before referring a DNAinfo reporter to the board's attorney. The attorney did not immediately respond to a request for comment. Lindsay Park, a Mitchell Lama housing development near Boerum Street and Lorimer Street, is managed by the board and supervised by the Department of Housing Development and Preservation. It receives tax exemptions to maintain affordability. The housing complex has recently been mired in conflict, as hundreds of shareholders have repeatedly and publicly complained about the board's management. Last year, some 900 residents signed a petition asking the board to be more open about its election policies, accusing Austin of using tactics that would result in her reelection as president. The campaign for fairer elections earned the support by Councilman Antonio Reynoso. Just this month, a group called Shareholders for the Betterment of Lindsay Park protested that the board wasn't being open about a $30 million loan for which it was applying. "Select shareholders were invited to participate at this meeting but then were promptly disinvited when they requested a copy of the loan application so shareholders could be better informed to participate at this meeting," a flier for the protest said. "DO NOT LET THEM FINALIZE THIS LOAN WITHOUT THE BOARD HEARING FROM US." Many Lindsay Park residents have long been suspicious of how the board manages money. "Ever since Cora [Austin] has been board president, she's kept everything secluded," said resident Carmen Padilla, who's a member of the shareholders group. "We don't know anything until after the fact." Padilla said residents weren't told about the reason for the investigation, but she was glad to see some action. "We have all these condos [around here] and Lindsay Park looks like a dump," she said. "We've been fighting it for a long time."